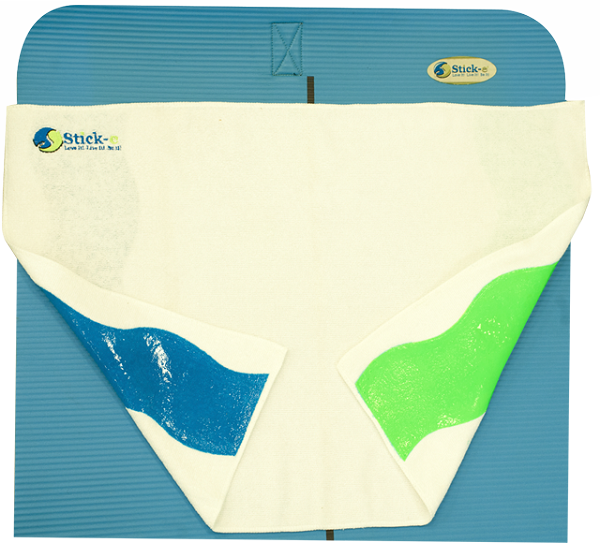 The Stick-e Fitness Towel provides a slip-less, sweat-absorbing, clean barrier for all of your exercise needs! The towel is super soft and absorbent. The back of the towel has two non-slip, exclusive, smooth, stick-e panels to ensure the towel does not slip during exercises. There are no bumpy projections to feel through the fabric! It provides a nice protective barrier for face and hands from less than clean mats and exercise equipment. Great for weight benches and cardio equipment! No more stepping off of the spinning machine, eliptical, or treadmill to pick up a fallen towel! Great item. I go to a yoga class that is pretty intense and my feet get kind of sweaty and this towel comes in very handy. I love it. I really enjoy products that are made with bamboo since it is such a sustainable renewable resourse. That is one reason I got this towel. I enjoy how sticky it is. It is such a benefit to my yoga practice and I have gotten more skilled since owning this towel. Worth every penny.